For quick, on-the-spot, compound-specific measurement of a wide range of toxic and combustible gases and vapors. Gas detection tubes operate in the following manner: An air sample is drawn through a tube containing a reagent, causing a color change. The concentration is then read from the length of the color stain in the reagent. The advantages of detection tubes over other analytical methods are simplicity of use, rapid response, low cost, and very low maintenance. 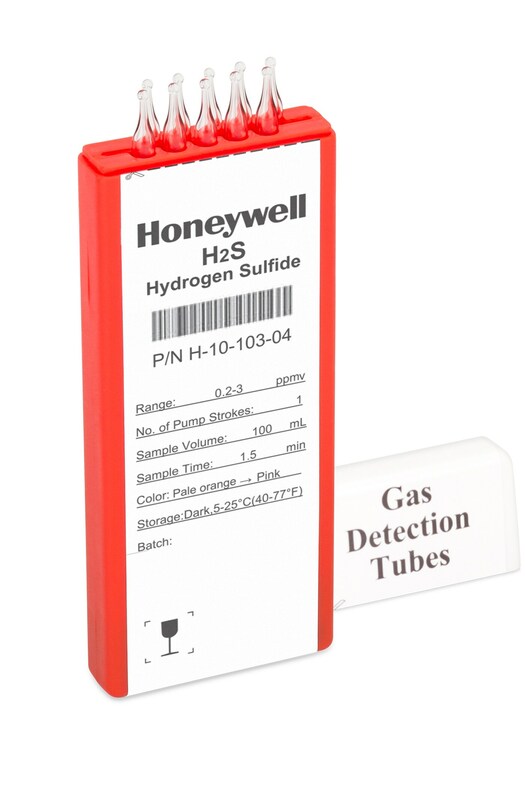 Because each batch of Honeywell tubes is pre-calibrated, no calibration equipment is necessary. Errors are prevented by directly marking the calibration information on each tube, and accuracy is further ensured by controlling the volume of air sampled. Honeywell tubes are primarily of the narrow bore type and are designed for use with a Honeywell handoperated piston pump. The LP-1200 is a piston-type hand pump that draws a fixed volume of gas, selectable at either 50 mL or 100 mL by rotating the handle. A tight vacuum seal is formed by a greased plunger gasket. The tapered rubber inlet accommodates a range of tube diameters for different types of tubes. The inlet filter prevents glass pieces and dust from entering the shaft. An end-of-flow indicator in the handle turns white when the gas sampling is complete. A pump stroke counter is rotated to keep track of the number of strokes completed.